Kokle – national symbol in Latvia! Kokle is an ancient Baltic string instrument, which with a time became one of the national symbol in Latvia! It has specific sound and therefore sometimes is lovely called Zelta kokles (The Golden kokle) or Dieva kokles (Kokle of Dievs). Dievs is main God – Creator, one who made this world. Other countries have very similar instrument: Estonians have Kannel, Finnish people have Kantele and Russians have Gusli. The earliest archaeological testimony of kokle-type instruments in Latvia dates to the 13th century. Kokle is made from a single tree, mostly ​​from birch, pine, willow or oak. It has a hollow trapezoidal hull in length 50-70 cm, covered with a wooden board – deck. A string pins made of wood is incorporated into the hull parallel to the widest edge. 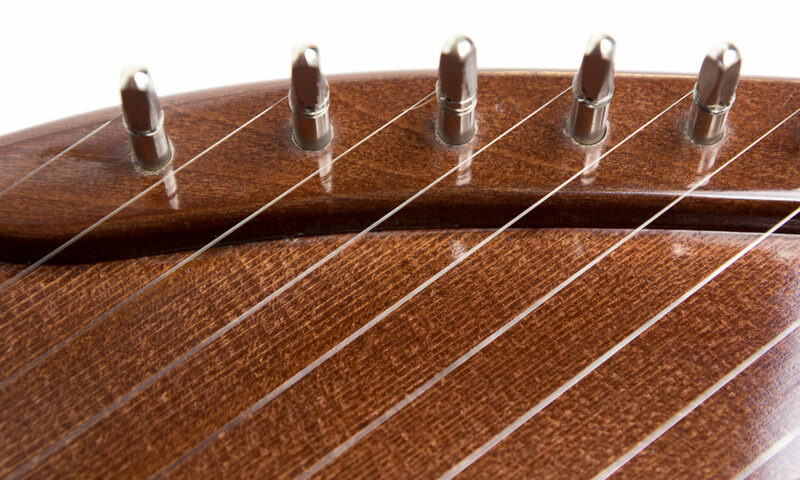 The thin edge consists of a built-in metal rod, around which the strings are wound. Oldest instruments had only 5 -7 strings, made from animal guts, the newest ones uses metal strings and have 9-11 or even more – up to the 33 strings. The player generally plays the instrument sitting at a table, strumming with his right hand to create vibrations and hence the volume, while using the left hand to mute unwanted strings. Sometimes you need to pick one or two strings with muting hand to add notes to melody or simply to make nice variation. The kokle’s sound has generally been mixed, mostly diatonic. The bottom string is usually under the bourdon function, and sounds all the time. In Skyforger we mostly use 9 -11 string kokle and tune them by most traditional tuning: (from bottom to up) G (major bourdon) A (minor bourdon) C D E F G A B-flat C D. If needed you can tune F to F# and B-flat to B and so on. Previous PostPrevious The Kantele for left-handed. Next PostNext Musical instrument you can easily learn and play.